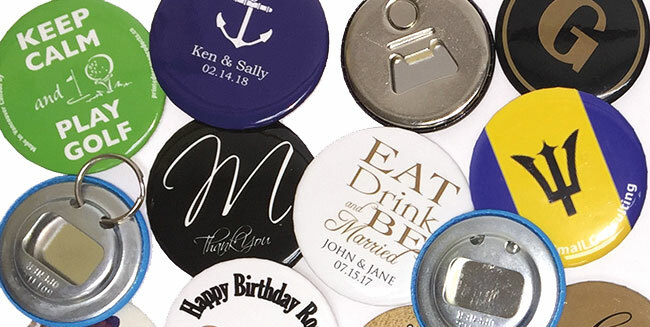 Bottle openers make great wedding favours, memorable gifts and unique promotional giveaways that will showcase your logo and events. Beside the standard bottle openers, we also make bottle opener keychains and magnetic bottle openers. These cool marketing items are laminated with a brilliant gloss that will highlight your artwork and provide protection. Minimum order is 25 units. We custom make all your bottle openers on site at our Vancouver, BC location. Bottle openers are digital printed in full colour (CMYK). RGB and Pantone® colours will be converted to CMYK. Bottle openers are packaged loose in boxes with packing paper. Packaging bottle openers in set amounts in resealable bags is available. We can also custom print display/donation boxes and bag toppers, contact us for a quote. Visit our stickers, notepads, fridge magnets, and coasters pages. Also, take a look at our Idea Guide which provides popular promotional products for various industries and events.